Why we are doing them? •Teach children to understand that it is okay to be stuck, and that some of their best learning is done when they find things the hardest. Rather than simply praising success we praise effort and persistence. •Teach children to love challenges, be intrigued by mistakes, enjoy effort, and keep on learning. For children who find work easy we make sure they encounter more difficult tasks. Our children recognise that effort and persistence are what help them improve. •It has been proven that having a Growth Mindset can improve children’s progress and attainment. How many 2 footed skips can you manage in 60 seconds? 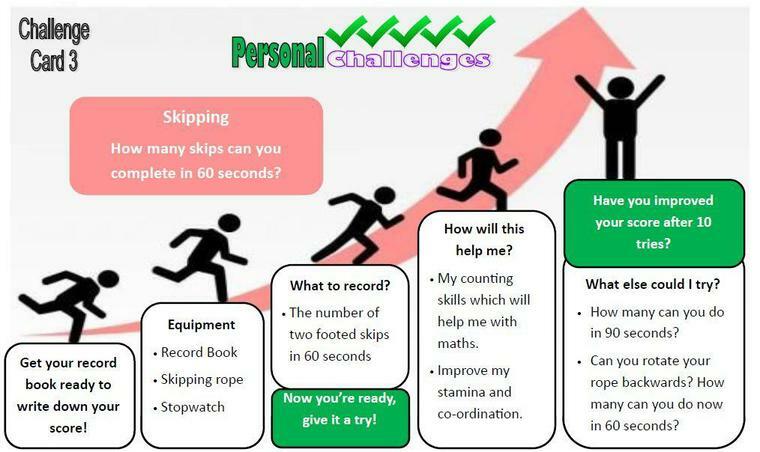 Remember to record your progress as you go - monitor your personal best - and use this to motivate you when training! To provide a boost to your performance we have arranged for skipping workshops to take place in early March - full details will be sent to each class soon!